The 1951 Buick Hydro-Lectric Power System is standard on Models 46C, 56C, 76C and 76R, and is optional equipment on Models 52 and 72R. This system provides power operation of the folding top, front seat, door and rear quarter windows. The 1951 Buick Hydro-Lectric Power System is a combination hydraulic and electric system in which hydraulic fluid pressure, generated by an electrically driven pump (the power unit) is piped to hydraulic cylinders which apply the fluid pressure in raising and lowering the top, raising windows, and moving the front seat forward depending upon the controls being operated: Spring pressure is used to lower the windows and move the seat rearward. Steel tubing is used for the pipes which conduct the hydraulic fluid between the power unit pump and the hydraulic cylinders which operate the folding top, windows and front seat. Rubber hoses are used at the power unit and where the lines enter the doors at hinge pillars, to provide the flexibility required at these points. The fluid pipes are formed in loops at the lower ends of folding top power cylinders to provide flexibility required by the slight hinging movement of these cylinders during operation. One pressure line runs from the power unit pump to the door window hydraulic cylinders and this line serves to return fluid from the cylinders to pump reservoir. Another pressure line runs from the pump to the seat adjuster, folding top control valve and cylinders, and rear quarter window hydraulic cylinders. This line also serves to return fluid from seat adjuster and quarter window cylinders to pump reservoir. A separate return line is provided for the folding top hydraulic cylinders. The car battery supplies the current used by the power unit motor. This current is controlled by a solenoid relay switch mounted on the motor. The solenoid relay switch, in turn, is controlled by the folding top, window and seat control switches located at convenient points in the body. 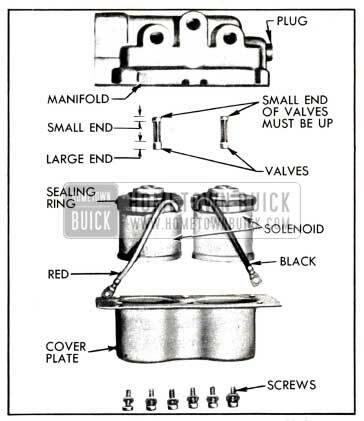 The ignition switch must be turned “ON” in order to operate any part of the 1951 Buick Hydro-Lectric Power System since all controlling circuits pass through this switch. The controlling circuits also pass through a circuit breaker, mounted on dash under the cowl, which protects the circuit wiring and electrical units. Current used by the power unit motor does not pass through the ignition switch and circuit breaker. 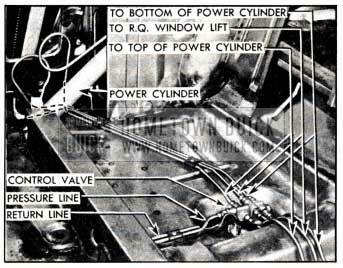 The circuit wiring diagrams for bodies having the 1951 Buick Hydro-Lectric Power System are shown in figures 10-120, 10-121 and 10-122. The power unit assembly provides hydraulic fluid pressure when required for operation of the folding top, windows and front seat. It is mounted on the right side of cowl under the rear end of front fender and may be reached by raising the hood. The assembly is cushioned on rubber mountings, is connected to the hydraulic fluid pipes by rubber hoses, and the motor is electrically grounded to the body by a flexible ground strap. See figure 13-53. The power unit assembly consists of an electric motor, a rotor type oil pump, and a fluid reservoir assembled vertically into a single unit. A solenoid relay switch is mounted on the motor frame and is connected to the motor terminal by a copper strap. The solenoid relay switch closes the circuit between the battery and power unit motor whenever the solenoid is energized by current flowing through any closed control switch. The current passing through the solenoid windings to ground causes the solenoid plunger to move upward until a contact on plunger closes the battery-to-motor circuit, thereby starting the power unit motor so that the pump can deliver fluid pressure. When the control switch is returned to neutral position the energizing circuit is broken, the solenoid is demagnetized and the plunger drops to break the battery-to-motor circuit. The pump inner rotor is keyed to the motor armature shaft; a spring-loaded seal and a drain-back passage in pump body prevent leakage of fluid around the armature shaft. Pump intake and drainback pipes pressed into the pump body extend down to near the bottom of the reservoir. The fluid reservoir is held to the lower side of pump by a snap-on spring wire bail, and a synthetic rubber gasket is installed between the pump and reservoir. The reservoir is vented to atmosphere through a small hole in pump body. A spring-loaded combination pressure-relief and drain-back valve is located in the outlet passage of the pump. When the pump is started, the valve opens against spring pressure to permit fluid to flow to any hydraulic cylinder requiring fluid pressure. As pump pressure increases, the valve opens farther to by-pass some fluid back into the reservoir; the valve spring is calibrated to regulate the fluid pressure at a maximum of 250-260 pounds per square inch. When the pump stops running, the spring closes the valve, and in this position the pump outlet is connected to the by-pass passage leading to the reservoir. Whenever a window is lowered, or the front seat is moved rearward, a spring in the window lift or seat adjuster forces fluid out of the hydraulic cylinder and back into the reservoir through the pressure relief valve. Fluid discharged from a folding top power cylinder does not drain back through the valve but returns to the reservoir through the pump intake pipe. The power system which operates the folding top consists of the power unit assembly described in paragraph 13-25, a control switch, a control valve, connecting fluid pipes and control circuit wiring. The folding top control switch is mounted on the left side of dash panel under the cowl. It is operated by a control rod and knob, marked “TOP,” at lower edge of instrument panel. With ignition switch turned “ON,” pushing the control knob forward causes the folding top to raise; pulling knob rearward causes top to fold down. When knob is released it returns to the neutral position. The switch controls the power unit motor through the solenoid relay switch as explained in paragraph 13-25, and also controls the control valve as described below. The fluid pipe from outlet side of power unit pump connects to the pressure or inlet port of the control valve, which is located under the rear seat cushion. From the control valve, pipes connect to the top and bottom ends of the folding top power cylinders, and a return pipe connects to the power unit reservoir at intake side of pump. Fluid flow through these pipes is controlled by solenoid operated valves inside the valve assembly. Another pipe connects the control valve to the rear quarter window lift cylinders. This line is not controlled by the valves, therefore the rear quarter windows may be operated independently of the folding top. See figure 13-54. The top control valve assembly contains two solenoid operated valves which control fluid pressure to the top or bottom ends of the top power cylinders as required to raise or lower the top, depending on the position of the control switch. The valves also control drain back of fluid to the pump reservoir from the ends of power cylinders opposite to those to which pressure is being applied. Operation of the valves in neutral, raising, and lowering the top is explained in subparagraphs b, c , d, below. Two hydraulic power cylinders are used to raise and lower the folding top. One cylinder is located in each rear quarter of body below the top hinge. Each power cylinder is a steel tube closed at each end by crimped-in die castings and enclosing a piston attached to a rod which extends through the upper end casting. The end castings have rubber seals to form fluid tight joints and have 1/8″ pipe-thread holes for hydraulic fluid pipe connections. The lower end casting of the cylinder forms a yoke which is hinged by a clevis pin to an anchor bracket on body floor. The upper end casting provides a bearing for the piston rod which is connected to the top linkage mechanism. When fluid under pressure from the pump passes through the folding top control valve into the lower ends of both power cylinders, the pistons are forced upward to raise the folding top. At the same time, fluid on upper sides of pistons is forced out of cylinders and back through the control valve to the power unit reservoir. 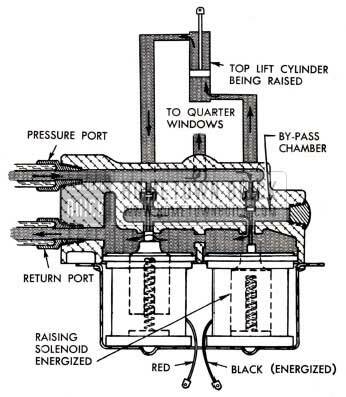 When fluid from the pump enters the upper ends of power cylinders, the reverse action takes place and the folding top is lowered. Figure 13-55 shows the control valve in a normal or neutral position. 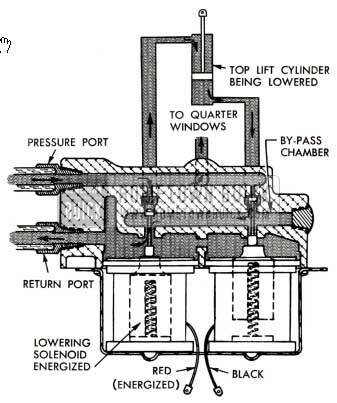 Note that there are three distinct chambers in the pressure manifold at the upper portion of this assembly; a pressure chamber, a by-pass chamber, and a return chamber. The springs of both solenoids hold the solenoid plungers and the valves in the “up” position, tight against the pressure openings. With the valves in this position, it is possible to operate the folding top by hand due to the by-pass chamber, which directly connects the lines from both sides of the top lift cylinder. Note that the pressure line is always connected directly to the quarter window line. When the top control switch knob is pulled rearward to lower the top, the power unit motor is started and the forward solenoid (with red wire) in the top control valve is energized. When this solenoid is energized, electro-magnetic force pulls the iron plunger and the valve down so that fluid from the pressure chamber is allowed to travel to the top of the folding top power cylinder, thereby forcing the cylinder piston down to lower the top. Displaced fluid from the bottom of the cylinder returns to the control valve, enters the by-pass chamber, escapes to the return chamber past the opposite valve, and returns to the pump reservoir. See figure 13-56. When the top control switch knob is pushed forward to raise the top, the power unit motor is started and the rearmost solenoid (with black wire) in the top control valve is energized. This opens the rear valve so that fluid from the pressure chamber is allowed to travel to the bottom of the folding top power cylinder thereby forcing the cylinder piston upward to raise the top. Displaced fluid from the top of the cylinder returns to the operating valve, enters the bypass chamber, escapes to the return chamber past the opposite valve, and returns to the pump reservoir. See figure 13-57. The power systems which operate the windows and the front seat are identical in principle, therefore both systems are covered in this paragraph. The power systems consist of the power unit assembly described in paragraph 13-25, control switches, window lifts or a seat adjuster, connecting fluid pipes and control circuit wiring. A window hydraulic regulator is installed vertically between the inner and outer panels of each door. The regulator consists of a frame, lift cylinder, and two springs. The lower end of frame is anchored to the door and operating arms on the upper end engage a cam attached to the window lower sash channel. The cylinder is installed in the frame so that its piston rod pushes upward on the operating arms to raise the window glass when fluid is admitted to the cylinder. The springs pull the operating arms downward to lower the window glass when the valve in cylinder is opened to allow fluid to escape. The lift cylinder is a steel tube inclosing a piston attached to a rod which extends through the upper cap. The upper cap is crimped in place and sealed to prevent escape of fluid. It houses a saturated felt which excludes foreign matter and acts as a permanent lubricant for the piston rod. The piston rod is rounded at the outer end to fit a formed seat in one window operating arm of the frame assembly. The solenoid valve which closes the lower end of lift cylinder consists of a solenoid winding and stationary core inclosing a spring-loaded plunger. The plunger contains a disk which is normally pressed against the valve seat by the spring pressure. When the solenoid is energized by current flowing through the closed control switch, the plunger is pulled upward to open the valve and permit the passage of fluid. When the control switch is in neutral position the solenoid is de-magnetized and the spring pushes the plunger down to close the valve. The rear quarter window lifts are similar in construction to the door window regulators (subpar. a), except that only one spring is used. The lifts are installed in a vertical position in the rear quarter section of body. A hydraulic seat adjuster regulator assembly is installed below the front seat to provide power operation of the seat. The seat adjuster regulator assembly consists of a frame, cylinder and one spring. Except for size, the internal construction of the cylinder assembly is identical with the door window lift cylinder assembly (subpar. a). The seat is moved forward by fluid pressure and moved rearward by spring pressure. To prevent forward movement of the seat during an emergency stop, a rachet mechanism is built into the frame assembly. In addition to the switches on the left door, each rear quarter window is controlled by a single switch on the rear quarter trim panel. A single switch is mounted on the left end of the front seat frame for control of the seat adjuster regulator. When the window (or seat) control switch is released it is in neutral position so that all electrical circuits are open. The power unit is stopped and the solenoid valve in regulator or lift cylinder is closed, thus blocking movement of the window (or seat). Since the valve is closed, no movement of window (or seat) can take place when the power unit is operated to move the folding top. Before attempting to move windows or seat, the folding top control knob must be in neutral position so there is no fluid flow ‘in the folding top power system. When the control switch knob is moved up to raise the window (or forward to move seat forward) the circuits to the solenoid relay switch on power unit motor and to the solenoid valve in the regulator or lift cylinder are closed. The solenoid valve opens to allow fluid to enter the cylinder and the power unit motor and pump start operating. 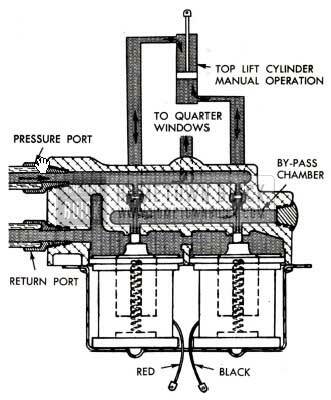 Fluid entering the cylinder causes the piston to raise the window (or move seat forward) against the tension of the return spring. When switch knob is released the circuits are broken, the power unit stops, the solenoid valve closes and the window (or seat) is held stationary by the oil trapped in the cylinder. Before attempting to move windows or seats the folding top control knob must be in neutral position so there is no fluid flow in the folding top power system. When the control switch knob is moved down to lower the window (or rearward to move seat rearward) the circuit to the solenoid valve is closed, causing the valve to open. The circuit to the power unit solenoid relay switch remains open, thus eliminating action of the power unit pump. When the solenoid valve opens, the pressure of the return spring forces fluid out of regulator or lift cylinder, back through the fluid pipe to the power unit reservoir. This spring action also moves the window down (or seat rearward). When switch knob is released it returns to neutral position. The solenoid valve circuit is broken, the valve closes, and the fluid trapped in cylinder holds the window (or seat) stationary. IMPORTANT: Every precaution must be taken to avoid entrance of dirt, water, or any trace of mineral oil into the hydraulic system. To guard against contamination make certain that containers used for fluid are absolutely clean and have not been used for mineral oil. Before working on hydraulic system be sure to cover adjacent trim and painted surfaces. Hydraulic fluid is injurious to car finish and damage is almost instantaneous. Hydraulic fluid is inflammable; be careful to avoid dropping fluid on hot manifold or exhaust pipe. 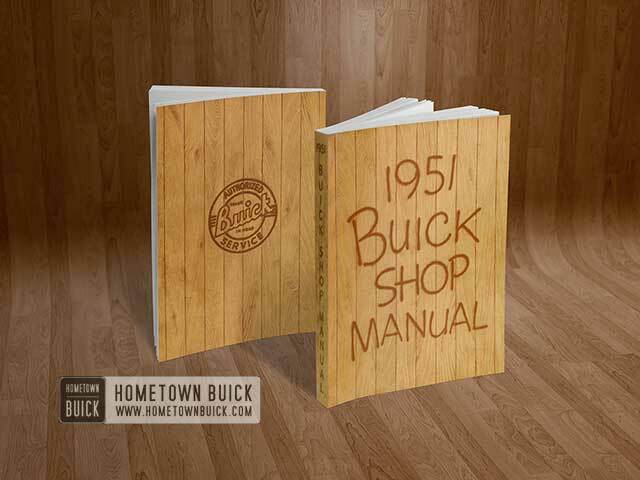 Cars equipped with the 1951 Buick Hydro-Lectric Power System have the power unit reservoir partially drained when shipped from the factory by rail or truck. A tag attached to a radio grille bar gives notice that reservoir must be filled before car is delivered to customer. Since the tag may become detached in handling it is always advisable to check fluid level before delivering any car. The following procedure must be used whenever it becomes necessary to check fluid level and add fluid. Lower the top, move front seat to rearward position, and fully lower all windows. Remove fluid reservoir and fill to the fluid level line (1/2″ below top), using Delco Super No. 11 Brake Fluid. Install reservoir. NOTE: Brake fluid heavier than No. 11 should not be used in extremely cold climates as it will cause sluggish operation of 1951 Buick Hydro-Lectric system. Operate the top, all windows and front seat several times each until all air has left the fluid system. If air is present, a chattering noise will be produced when top, windows, or seat are operated. After all air has been expelled, lower the top, move seat back, and fully lower all windows. Again remove reservoir and adjust fluid level to the fluid line (1/2″ below top). Install reservoir, making certain that gasket is in good condition and that reservoir makes full contact all around. CAUTION: Any leakage of dirt or water into reservoir will cause serious damage in 1951 Buick Hydro-Lectric Power System. Lower the top, move seat fully rearward, and fully lower all windows. Disconnect battery to avoid accidental operation of power system when pump reservoir is removed. Remove and empty pump reservoir. Place a receptacle under pump to catch fluid, then manually raise and lower the top several times. This operation will drain fluid from both ends of the power cylinders. Thoroughly clean all sludge from reservoir, using Declene (Group 4.683) or 99 % methyl alcohol. Fill reservoir to the fluid line (1/2″ from top) with Delco Super No. 11 Brake Fluid and install on pump. Connect battery, using care to properly wind clock (par. 10-66, b). Operate the top up and down to pump, the fluid into the power cylinders. Additional filling of reservoir will be necessary as the capacity of the two power cylinders is almost double that of the reservoir. With reservoir filled to level line, operate top up and down until all air has been expelled from this part of system. If air is present a chattering noise will be produced during operation of top. After all air has been expelled from top hydraulic system, operate the front seat and all windows until all air has been expelled from these systems. Remove reservoir and adjust fluid level to the fluid line (1/2″ below top). Install reservoir making certain that gasket is in good condition and that reservoir makes full contact all around. Failure of any part of the Hydro-Lectric Power System can result from three major classes of faults, namely: (1) Mechanical, (2) Electrical, (3) Hydraulic. Before doing any work on the electrical or hydraulic systems it is always advisable to make sure that the fault, is not mechanical. Mechanical interference due to luggage or other objects; hold-down strap not removed, or top not free from windshield header studs. Electrical shorts or loose connections in control switch circuit or faulty control switch (par. 13-30). Hydraulic fluid low; power unit pump inoperative; stoppage in fluid pipes (par. 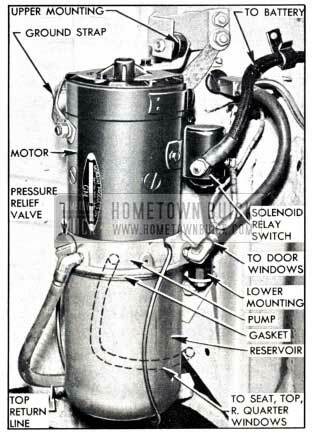 13-30); valves inverted in control assembly (par. 13-30, c). Mechanical interference, same as in subparagraph a. Electrical shorts or loose connections in control switch circuit or faulty control switch (par. 13-32). Hydraulic power cylinder faulty; stoppage in fluid pipes; one valve inverted in control valve assembly (par. 13-31, c). Mechanical interference from door arm rest screw; misaligned glass run channel or window guide (par. 13-23); window lift not connected to lower sash channel. Electrical short or loose connection in “BAT,” “MOT” or “CYL” circuit, or cylinder solenoid inoperative (par. 13-30); power unit motor inoperative (subpar. k). Hydraulic fluid low; hoses crimped or stoppage in fluid pipes (par. 13-30); pump pressure relief valve stuck; cylinder piston rod disconnected. Mechanical binding due to misalignment; glass run channels excessively wet. If window does not fully close, stops are improperly adjusted (par. 13-23, b) or there is insufficient hydraulic fluid. Electrical failure due to low battery (par. 10-17). Hydraulic failure due to stuck pump pressure relief valve. If a window moves slowly downward when control switch is in neutral position, the solenoid valve in window lift cylinder is leaking. Mechanical binding due to misalignment; glass run channels excessively wet; window lift return spring broken. Hydraulic fluid old, congealed, or too heavy for prevailing temperatures; pump pressure relief valve stuck. Electrical control circuit crossed due to switch “CYL” terminal touching “BAT” terminal. Hydraulic pressure too high if more than one window raises. Electrical control circuit crossed due to switch “CYL” terminals touching. Hydraulic pressure too high (par. 13-30). Mechanical interference from object under seat; seat adjuster misaligned; seat adjuster not attached to seat frame or floor. Electrical fault same as for window (sub­par. c). Hydraulic fault same as for window (sub­par. c). Same as for windows operating slowly upward (subpar. d) or downward (subpar. e). Mechanical interference due to misalignment. Electrical fault due to low battery (par. 10-17). Hydraulic fluid too heavy; pump pressure relief valve stuck; crimped fluid hoses or stoppage in fluid pipes (par. 13-30). When running, the power unit has a clearly audible whirring sound. Wiring connections between ignition switch and solenoid relay switch loose, dirty or disconnected (par. 13-30). When the Hydro-Lectric Power System fails to operate properly, two important service inspections should be made before making any other inspections and tests. Check the battery and cables as described in paragraph 10-17. If battery specific gravity is below 1.200 the voltage may be sufficient to run the power unit motor but may not be sufficient to operate power cylinder solenoid valves also. Check the level of fluid in pump reservoir as described in paragraph 13-28. Aside from low battery, failure in the electrical system may be due to circuit faults such as loose or dirty wiring terminals, shorted or grounded wires, inoperative circuit breaker, inoperative switches or solenoids, or inoperative power unit motor. It is necessary to test each part of the affected circuit to determine the cause of failure. In general, tests may be made in the same manner as for other electrical circuits in the car. A jumper wire may be used to bridge around a wire or unit, or to provide a positive ground. A 6-volt test lamp or a voltmeter may be used to determine whether current is flowing or is available at a given unit. In applying these methods of test refer to the circuit diagrams given in figure 10-120, 10-121 or 10-122 and pay particular attention to color codes specified for wires and terminal markings on the units. When it is necessary to remove a window or seat control switch for test, press a thin bladed tool between the switch and trim pad to depress the spring clips which attach the switch to the retainer which is fastened to the trim pad. To check operation of switch, wiring and solenoid valve in cylinder of window lift (or seat adjuster) without removing trim pad, turn ignition switch “ON” and push control switch knob up or down. A sharp “click” will be heard when contact is made. If no “click” is heard either the switch, wiring, or solenoid is at fault and each part should be tested individually. The fluid pressure of the power unit pump is controlled by the pressure relief valve to maintain a maximum pressure of 250 to 260 pounds per square inch. Under no circumstance should the valve be changed to provide a higher pressure. In conjunction with the spring on the valve, washers are also added under the head of valve plug to adjust for the specified pressure. When valve is removed for cleaning be sure to reinstall the same number of washers. After making certain that the hydraulic system is properly filled with fluid, the system may be checked for proper pressure at the pump and then at the various units by disconnecting the fluid hose or pipe and inserting Hydraulic Pressure Gauge KMO 687. With pressure gauge inserted at pump pressure outlet (fig. 13-53) and ignition switch turned “ON,” test output pressure of pump. If top is raised, push control knob forward (if down, pull knob rearward), hold for 10 or 15 seconds and then note gauge reading. This should be 250 to 260 pounds. If pressure is below normal, the pump must be inspected and the trouble corrected. When installing pressure gauge at top control valve, connect at port leading to top end of power cylinder if test is made with top raised; if top is down connect at port leading to bottom of power cylinder. See figure 13-54. Make test as previously described. If pressure is below normal, the trouble is either in the hose or pipes leading to control valve, or in the valve itself. When installing pressure gauge at top power cylinder, connect at top end if test is made with top raised; if top is down, connect to bottom end. If pressure is not normal, the trouble is either in the fluid pipes or fitting between the control valve and cylinder or in the cylinder itself. When pressure gauge is installed at power cylinder of window lift or seat adjuster, subnormal pressure indicates trouble in the fluid pipes, fittings or hoses between power unit and cylinder or a leak in the cylinder itself. Do not disconnect any fluid pipe without first disconnecting the battery to prevent accidental pumping of hydraulic fluid on finished surfaces or upholstery. Hydraulic fluid will damage lacquer finishes. When a fluid pipe is disconnected, there will be a certain loss of fluid and, under certain conditions, the fluid may be pressurized in the line. Always have ample rags or a suitable receptacle to catch this fluid and prevent damage or possible fire; hydraulic fluid is inflammable. When a fluid pipe is disconnected, be sure to plug or cap open end of pipe to avoid entrance of dirt, and in case the battery has to be connected for any reason. Also tape ends of any wires that may be disconnected. The top must not be operated manually while the pump is disconnected except while cleaning system. Before connecting fittings or pipes, sparingly apply a coating of “Amberoid Cement” or “3-M Adhesive EC-847” to threaded areas to prevent possible seepage of fluid. After pipes are connected, operate the top, seat, and windows through several cycles to expel all air and fill reservoir to fluid line (par. 13-28). If a fluid leak develops around the piston rod of the folding top power cylinder it may be corrected by replacing the seal, using parts furnished in Oil Seal Package, Group 14.482. Raise and lock folding top. Remove rear seat cushion and back, then remove rear quarter trim panel. Remove nut and bolt attaching piston rod to folding top linkage. Check piston rod for burrs and remove any with fine emery cloth. Push piston rod half way down and remove the yoke. Unsnap oil seal washer retaining clip from groove in cylinder, then pull piston rod out until both steel washers and the felt washer can be removed. Use a sharp pick to remove the rubber oil seal washer. See figure 13-58. Install new rubber washer, felt washer, and clip from the oil seal package. Install all parts in the order shown in figure 13-58. Install yoke on piston rod and connect to folding top linkage. Clean up any fluid around end of cylinder and operate the top to check for proper sealing of piston rod. Remove solenoid cover plate, then remove each solenoid by rocking gently until the rubber sealing ring is freed from the pressure manifold. See figure 13-59. Remove the two valves from manifold and check for any burrs or foreign matter. Remove the by-pass access hole plug from pressure manifold and check manifold inner chambers for foreign matter or burrs. Carefully clean the valves and manifold, then install access hole plug. Insert both valves into pressure manifold, small end first. See figure 13-59. CAUTION: If one valve is installed with large end first, the top will operate in one direction only and cannot be manually moved in either direction. If both valves are inverted the top cannot be operated by power or manually in either direction. Install solenoid with red wire in manifold opening nearest the pressure and return pipe ports and install solenoid with black wire in opening nearest the access hole plug. Use care to avoid damaging the rubber sealing rings during installation. See figure 13-59. Install solenoid cover plate. When control valve is installed in the body, seal the pipe connections as specified in sub­paragraph a above. Springs and cylinders are furnished separately so that it is unnecessary to replace the entire regulator assembly when a spring or cylinder fails. When replacing a spring use extreme care to avoid personal injury in case the heavy spring gets out of control. 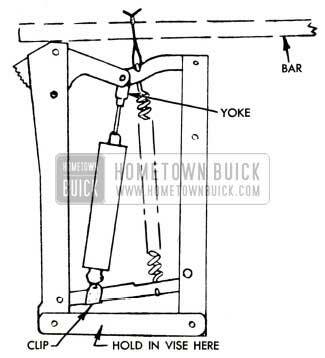 With the regulator frame held securely in a vise, use a wood pry bar and loop of heavy wire to unhook or attach the spring as shown in figure 13-60. To replace the cylinder in a seat adjuster regulator, remove the spring and the clip attaching cylinder to the frame bar, then unscrew the cylinder piston rod from the yoke; leave yoke attached to frame. See figure 13-60. Install parts by reversing this procedure. CAUTION: When using a wrench on piston rod do not grip rod more than 3/8″ from yoke as any burrs on rod more than 3/8″ from yoke will damage the rod oil seal in cylinder. 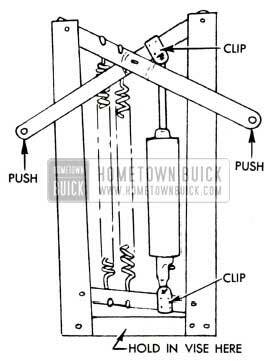 To replace the cylinder in door window regulator, hold the lower end of regulator frame securely in a vise, remove clips at both ends of cylinder, then push upward on both ends of regulator arms to free the cylinder. See figure 13-61. Install cylinder by reversing this procedure.